Where we learn, live, labor, worship and volunteer matters. Many people think of their homes or workplaces when they want to go green. This section of our website is dedicated to the other places we love and in which we spend time. You're someone who cares about sustainability or is a green building professional. But what other hats do you wear? Are you active in your church? Are you on the Board of the local food bank? Do you volunteer with your local PTA? We all have lives outside of green building and sustainability, but that doesn't mean we have to take off our sustainability or LEED professional badge when we're wearing another hat. Our expertise is valuable and can help advance sustainability within social service, cultural, faith, educational and many other community-based organizations. They are so often aligned with our vision of efficient, healthier places to live, work, learn and play -- they just need a bit of help to get started! Raising awareness on the benefits of green building and how to get started. Helping organizations advance sustainability in their communities. Collaborating with partners on advocacy and service. 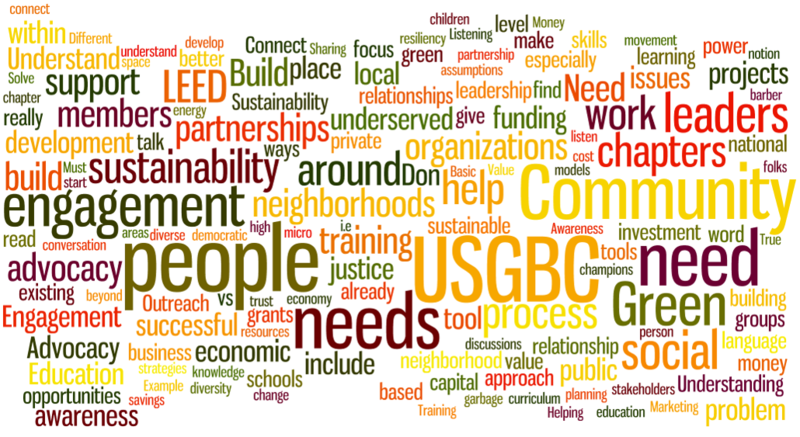 What is needed to truly support community-based sustainability in underserved communities? Advance the sustainability of the organizations you love. Network and have fun with a global network of volunteers. Share your green expertise and awesomeness with new audiences. Get out in front of potential new clients. Grow professionally through hands-on action ... and get CMPs. Access new knowledge, data and resources. Increase local knowledge of and demand for green products and services. See tangible fruits from your labor. Public speaking on green building. Outreach through conferences, events and expos. Meeting with local organizations to discuss green building. Facilitating a sustainability plan for a local organization. Organizing events, activities or service projects. Establishing local partnerships through your USGBC Florida Chapter. Recruiting other volunteers to develop a local action plan. Let's help others move the dial toward a more sustainable built environment by focusing on the organizations and places that are important to us and our communities. Get involved today!